What are the most important tools in the game of life? Max Thorpe and Chris Williams argue that grit – the ability to persevere through difficulty - and resilience - the ability to rise after you fall – are the critical and defining characteristics of personal growth and human progress. 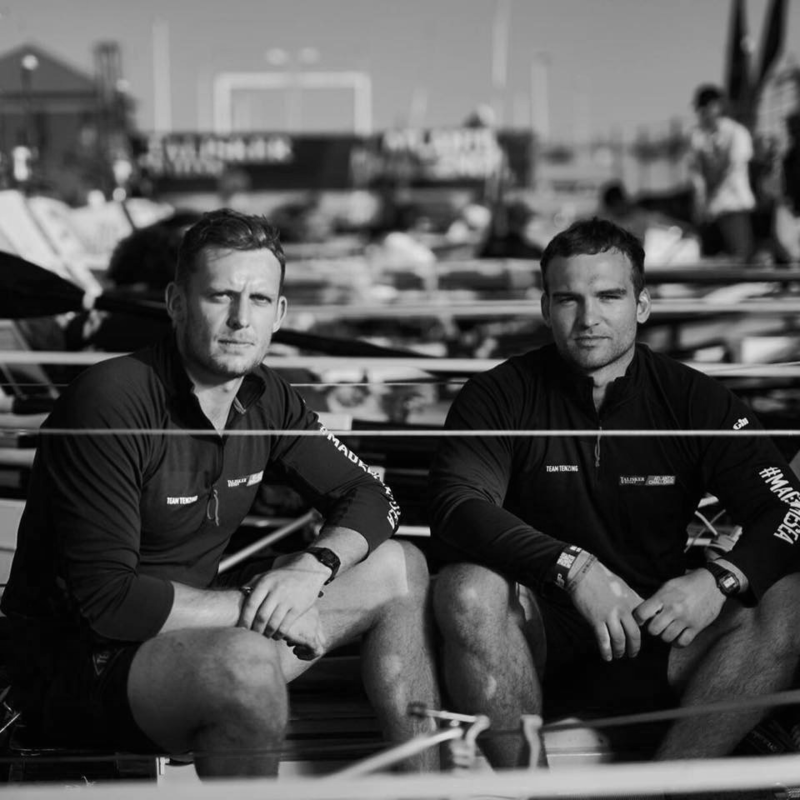 Drawing on their near-death experience when rowing across the Atlantic Ocean – regarded as the most dramatic and perilous sequence of events in ocean rowing history – they offer clarity on how just a few simple steps can help you discover and engage these traits, enabling you to create, innovate, endure, and achieve more than you ever thought was possible. Max and Chris grew up just around the corner from each other in Tunbridge Wells and have been best friends for around 15 years. Max went to Sevenoaks School and Chris went to Judd School. Sport has been a huge part of their lives and their friendship was solidified playing alongside each other in several clubs and teams. After completing their degrees at University of Nottingham and University of Leeds respectively, they sought new competitive drive and new challenge. They decided this was to be an attempt to row across the Atlantic Ocean in 2017. During our experience, we had to navigate through a relentless series of life-threatening moments. When the situation spiraled out of control, we were forced to change ourselves. We believe our experience has caused us to develop incredibly valuable characteristics for navigating life. Equipped with both the knowledge and experience of what these traits are, it was the realisation that they are not just essential but, most importantly, accessible to all, and this was our call to action on delivering this talk. Overall, we want the audience to feel inspired to challenge themselves more regularly, in turn actioning real personal growth. The key challenges for us is that our experience is one of such intense psychological turbulence alongside it being a relatively fresh experience as well (10 months ago). There is plenty that can be drawn from our experience and it has taken time for us to be able to be comfortable with and clarify our own thoughts, vocalise those emotions and feelings, identify the true lessons we have learnt, before consolidating, and pinpointing a singular idea that encapsulates this experience in just 12 important minutes. Lastly, weaving the concise narrative through the talk to deliver maximum impact. To prove that our story and message offers a real opportunity for others to better themselves. David Blaine: How I Held My Breath for 17 Minutes – we are fascinated by the power of the mind in achieving what appear to be physical challenges. This talk epitomises what the body can achieve with a powerful mindset. Ricardo Semler: How to Run a Company with (almost) No Rules – we have a passion for unlocking human potential across all aspects of life. Getting the most out of employees in business is often overlooked and Ricardo Semler sends a powerful message (with the evidence of success) about how radical employee-driven business models promoting transparency and trust can cause radical increases in performance. This is how we will run our companies in the future! We believe Tunbridge Wells has a pride in its own citizens. The local community has always promoted a message of home-grown ideas and value. An event like this brings together some of those to encompass the productive, positive and inquisitive mind-set of the town. The majority of TED’s ‘ideas worth sharing’ draw their power from the experiences of their authors/speakers. The impact of recounting experiences is through storytelling. For this reason, we would say the most important thing to retain in a TED talk is authenticity. Don’t force a story to be relevant, don’t fabricate a story to gain traction, and definitely don’t fake anything. For the audience to believe, you have to believe. Your idea must already be such an integral part of your own psyche that it has come to define who you are. From this position, you will have all the ingredients to create an ‘idea worth spreading’. To better understand both the importance of building resilience and the way in which challenges can offer opportunity to do so. We would hope every member of the audience sets themselves a new challenge to take on in the 12 months following our talk. You can find Max on Instagram, Chris on Instagram, and the two of them together on Instagram.